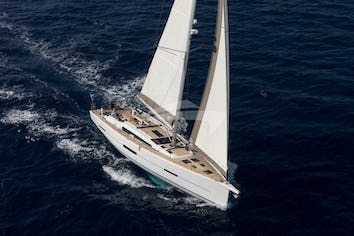 The 52 is the first model introducing this new generation in the Lagoon fleet. With it's diamond-shaped vertical bows, contemporary styled hulls and it's levitated hardtop, the Lagoon 52 stands out from the crowd. The yacht offers plenty of entertainment and lounging areas; a vast flybridge, a cozy forward cockpit and a spacious aft cockpit. All ropes and controls are located on the flybridge, away from the living areas. 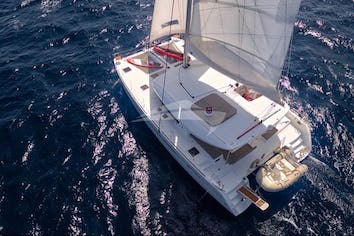 Lagoon really seem to be setting the bar when it comes to 50ft - 65ft catamarans. As you can see from the photos the interior is of a high quality and with this 5 cabin layout she has a master cabin, 3 double cabins & a bunk room all with en-suites. The crew uses the 5th cabin and the price reflects this. Inclusive package includes; All breakfasts & lunches, soft drinks, tea & coffee onboard, yacht fuel & water. €475 per adult & €375 per child under 16, per week. Aurous is a 5 cabin layout; 1 master, 3 double and a bunk cabin. The crew use one cabin, this is either the aft port cabin which has access from the cockpit or they can use the bunk cabin. September 2017: "What a great way to see the islands. Aurous is a beautiful boat, lots of space to relax and you feel very special pulling into harbour on her. It literally was a completely stress-free week from beginning to end, with James’ effortless handling of the boat, Jesse keeping everything running while preparing a constant stream of food and snacks, and the two of them somehow also able to make time to entertain and show us around the various harbours and bays, and guiding us to the best bars and restaurants"
September 2017: "We’ve been back just under a week but the joy of being on Aurous lives with us daily. July 2017: "I am sitting in my office looking at my photo’s of one of the best holidays we have ever had – and we are not short on holidays . I booked Aurous to celebrate my 60th with my family and it could not have been a more perfect choice – Not only were we blessed with perfect weather in a wonderful part of the world , on a boat that ideally suited our desire for a floating luxury villa , but we were lucky enough to have the perfect crew in James and Jessie . We cannot praise them highly enough . Not only are they highly professional , their sailing and culinary skills are of the highest order and their work ethic unbelievable . In our experience they are unsurpassed as hosts . Without them the week simply would not have been the same."